Born Aug 12 19162,4 [Aug 12 19115, Aug 12 19146,7, Aug 12 19158, about 19133], Winston-Salem, Forsyth County, North Carolina2,4. He married Beulah Mae Williams, Nov 2 1935, Virginia.2 Beulah was born Jan 28 19206 [Jun 28 19202,3,8], Virginia6. 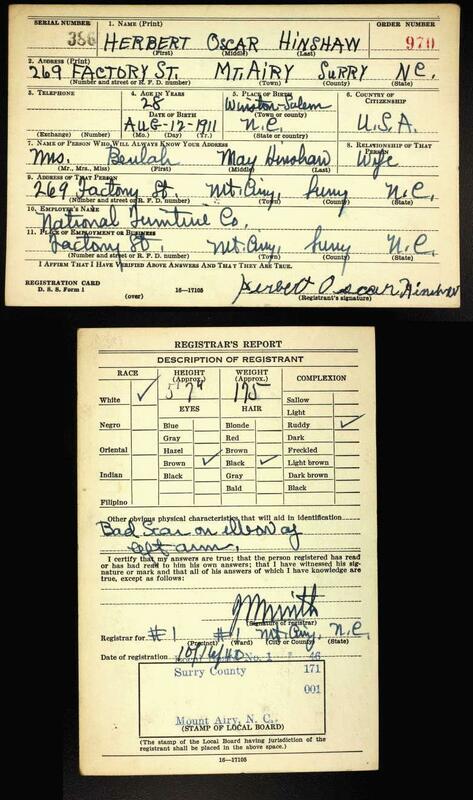 Hinshaw, Herbert O, head-of-household, age 27, born in North Carolina; completed 4th grade; on Apr 1 1935 was living in the same place/town; rented home ($7/month rent); occupation: caser, furniture factory; worked 48 weeks in 1939; $648 wages in 1939. Hinshaw, Beaulah, wife, age 19, born in Virginia; completed 6th grade; on Apr 1 1935 was living in the same place/town. 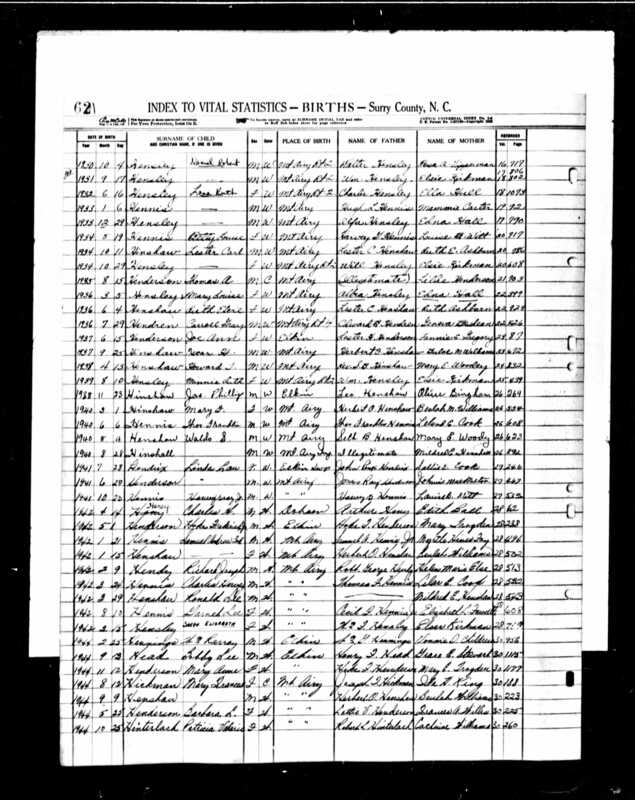 Hinshaw, Haywood O, son, age 2, born in North Carolina. Hinshaw, Mary F, daughter, age 4 months, born in North Carolina. Ancestry's "One World Tree" (submitter "unknown"); http://www.ancestry.com. 1940 census, Mt. Airy, Mt. Airy Township, Surry County, North Carolina; roll T627-2977, ED 86-18, page 11B, line #51, household #214. 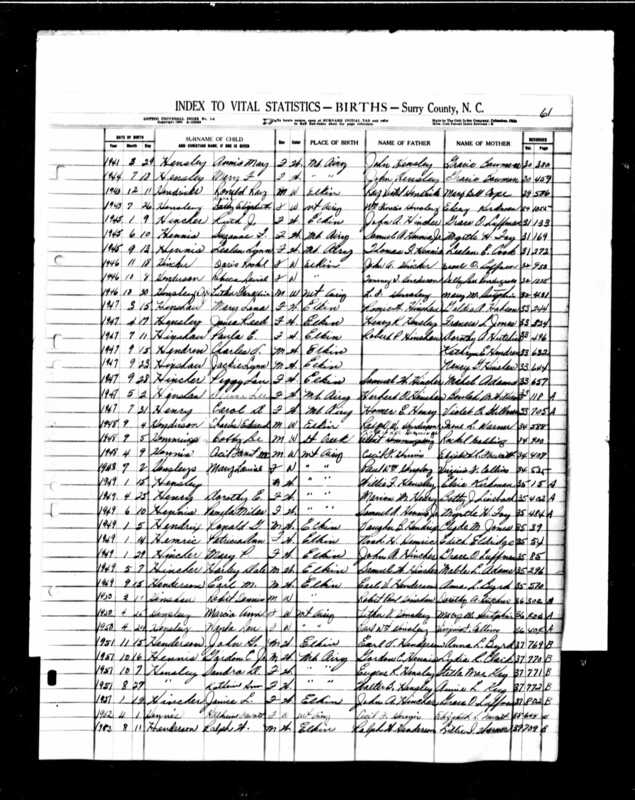 1920 census, Winston-Salem, Forsyth County, North Carolina; roll T625-1298, ED 93, page 23A, line #13, dwelling #435, family #484. 1930 census, Tabernacle Township, Randolph County, North Carolina; roll T626-1715, ED 30, page 1A, line #10, dwelling #3, family #3.